New York (6 July 2009 LT) — Luna Society International has announced that a crater on Earth’s Moon will be renamed “Michael Joseph Jackson” in honor of the celebrated entertainer, who passed away on June 25, 2009. The crater, previously designated as Posidonius J, is located in the Moon’s Lake of Dreams (Lacus Somniorum). It measures approximately 22 kilometers (about 13.5 miles) in diameter, and is located adjacent to a 1,200-acre parcel owned by Michael Jackson in the Lake of Dreams. The decision to designate the crater in Jackson’s honor came following a special session of the Luna Society’s governing board on Monday morning. The designation proposal had been widely suggested during the week by fans and fellow landowners following Mr. Jackson’s untimely and unfortunate passing last month. Mr. Jackson (1958-2009) was among the largest private owners of Lunar property claims. In addition to his significant parcel in the Lake Of Dreams, which he obtained in 2005, he also owned a smaller property in the Sea Of Vapours (Mare Vaporum). 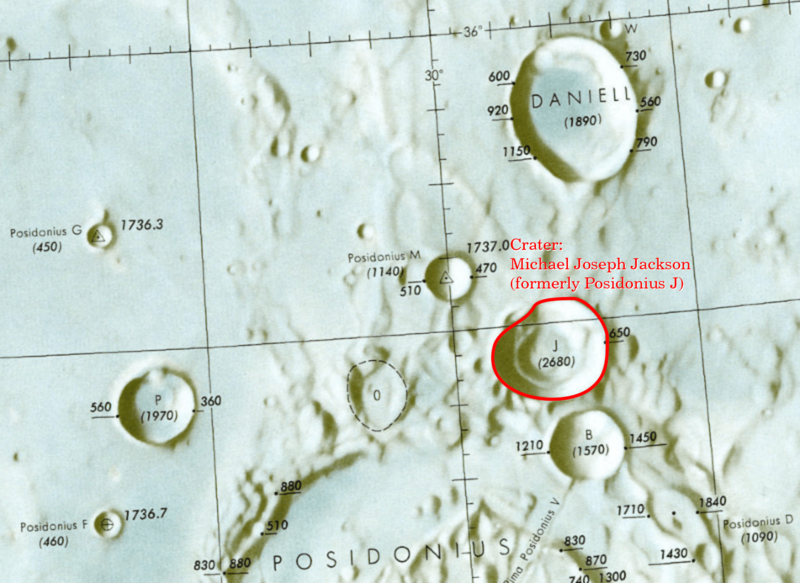 The crater shall be officially designated as “Michael Joseph Jackson” in order to differentiate it from the existing “Jackson,” a 71-kilometer crater on the Lunar farside named for the renowned Scottish astronomer John Jackson (1887-1958; it is noted, coincidentally, that John Jackson died the same year that Michael Jackson was born). Often in his life, Michael Jackson incorporated the Moon and its symbology, from his trademark “moonwalk” dance move to the official seal of his beloved Neverland Ranch. “Moonwalk” was also the title of his best-selling 1988 autobiography, while “Moonwalker” was the title of a popular compilation of his greatest music video performances. He also recorded a song, “Scared Of The Moon,” which has not been released commercially as of this date. Mr. Jackson claimed that he had once witnessed a UFO during a plane flight. His interest in outer space, extraterrestrials, and his plan to someday actually perform the “moonwalk” dance move on the Moon were detailed in Michael C. Luckman’s “Alien Rock: The Rock ‘n’ Roll Extraterrestrial Connection,” published by Pocket Books and VH1, which devoted an entire chapter to Mr. Jackson. Map detail showing location of Moon crater designated for Michael Jackson. Crater Michael Joseph Jackson is part of the Posidonius crater group, named for Posidonius of Apameia, a Greek Stoic philosopher, politician, astronomer, geographer, historian and teacher native to Apamea, Syria. Michael Joseph Jackson is the largest of the so-called “satellite craters” in the group, which numbers twelve in total, ranging in size from two to fifteen kilometers in diameter. Under the naming system of Félix Chemla Lamèch, Posidonius J was once also known as Héllène. The designation to honor Michael Jackson becomes effective immediately. The official designation of a Lunar crater is a singular honor bestowed upon only a select few luminaries. Among those receiving this rare tribute over the past century are Leonardo da Vinci, Christopher Columbus, Sir Isaac Newton, Julius Caesar and Jules Verne. ADDENDUM: In response to numerous inquiries, it should be noted that craters Michael Jackson, Posidonius and the other larger craters in the Posidonius group may generally be viewed from Earth using a typical home telescope under standard observational conditions. Luna Society International is the world’s largest and most prominent group advocating privatized exploration, settlement and development of Earth’s Moon. The centerpiece of the Society’s effort is a ten-year, US$3.8-million program to return humans to the Moon and establish permanent bases there. The Society has also developed the most successful commercially-available lunar photomap software ever released to the public, the Full Moon Atlas (http://www.fullmoonatlas.com), and successfully advocated the removal of a crater named for an accused Nazi war criminal, Dr. Hans Eppinger, Jr., by the International Astronomical Union.